Dr. Who is a character based on the Doctor, the protagonist featuring in the long-running BBC science fiction television series Doctor Who. The character, portrayed by the actor Peter Cushing, appeared in two films produced by AARU Productions; Dr. Who and the Daleks (1965) and Daleks' Invasion Earth 2150 A.D. (1966). Plans for a third film were abandoned following the poor box office reception of the second film. Whereas the contemporary television incarnation of the character was depicted as an abrasive, patronising and cantankerous extraterrestrial, as portrayed by Cushing Dr. Who is an eccentric inventor who claims to have created a time machine, named Tardis, in his back garden. He is a gentle, grandfatherly figure, naturally curious, sometimes absent-minded but not afraid to fight for justice. He is shown to have a keen and somewhat juvenile sense of humour, a strong sense of adventure, a will of iron and very strong morals. Unlike his TV counterpart, for whom the character's name is ambiguous, his surname is clearly stated to be "Who" in both films. In the first film, Dr. Who travels with his two granddaughters: Susan (Roberta Tovey), who is portrayed as a younger character than the Susan depicted in the TV series, and Barbara (Jennie Linden). They are joined by Ian Chesterton (Roy Castle), Barbara's "new boyfriend", who is depicted as a generally clumsy and comical figure (whereas the TV version of the character is more heroic, and his relationship with Barbara is amicable and professional rather than romantic). In the sequel, Susan is joined by Dr. Who's niece Louise (Jill Curzon) and police constable Tom Campbell (Bernard Cribbins). The exterior of Dr. Who's Tardis (not "the TARDIS", as referred to in the television series) resembles a British police box, although the films, unlike the TV series, offer no explanation as to why the machine has this appearance. Other than using the contrivance of the craft's interior being larger than its exterior, the interior set bears no relation to the clean, high-tech TV version of the time. In the first film it is filled with a chaotic jumble of wiring and electronic equipment, replaced in the second film by a number of simple consoles adorned with buttons, gauges and lights. In addition to the two films, Dr. Who has appeared in a Dell comic strip adaptation of the film, the comic strip Daleks versus the Martians in the 1996 "Spring Special" of Doctor Who Magazine, and the short story The House on Oldark Moor by Justin Richards, published in the BBC Books collection Short Trips and Sidesteps. During the late 1960s, there were plans for a radio series starring Peter Cushing as the voice of Dr. Who. Under a collaboration between Stanmark Productions and Watermill Productions, a pilot was recorded and a further 52 episodes were to be produced. The pilot story (entitled Journey into Time) featured Dr. Who and his granddaughter travelling to the time of the American Revolution. The script was written by future Doctor Who TV series writer Malcolm Hulke. The recording was subsequently lost. ^ Peel, John and Terry Nation: (1988). The Official Doctor Who & the Daleks Book. New York: St. Martin's Press. ISBN 0-312-02264-6, pp. 99-100. 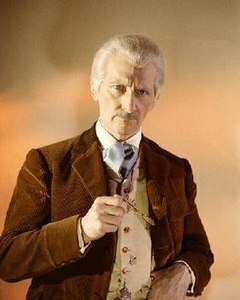 ^ Peter Cushing. Peter Cushing: an autobiography. London: Weidenfeld and Nicolson. ^ Hearn, Marcus (2013). "The Peter Cushing Scrapbooks". Doctor Who Magazine. Panini Comics (461): 16–21. ^ Norton, Charles (2013). Now On The Big Screen, p. 17. Telos Publishing, Prestatyn. ISBN 978-1-84583-084-7. ^ Foster, Chuck (2012-01-15). "Missing Radio Script Discovered". Doctor Who News Page. This page was last edited on 21 October 2018, at 22:44 (UTC).